Her name is Kate. 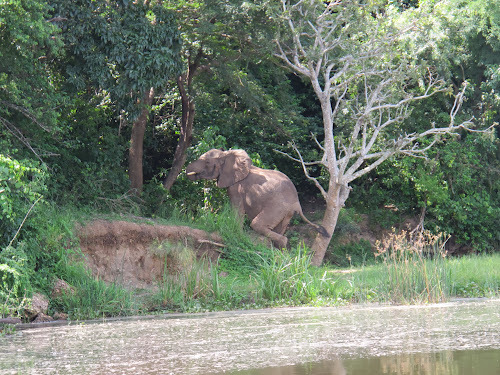 Her fondness for elephants planted a seed of an idea that someday she wants to do missionary work in Africa. It’s a someday idea for Kate because she’s eleven years old and when she donated $18, she became the first child to be a Vigilante of Kindness for Uganda. When I was eleven, I babysat the neighborhood kids and earned $2 an hour. It would’ve taken me 9 hours to earn Kate’s donation. Nine hours of changing diapers and reading bedtime stories and telling kids to stop running with that in the house. NO WAY IN HELL did I ever even entertain the idea of giving my cash away to someone else. Absolutely no way. That was hard-earned candy money right there. I understand that babysitting rates have increased significantly since that time, but even still eighteen dollars isn’t easy to come by when you’re eleven. Shoot, sometimes eighteen dollars isn’t easy to come by as an adult. Dear ones, I’ve lived those days when Top Ramen was on the dinner menu almost all of the time and running the air conditioner was a luxury we could only afford when temperatures scorched past one hundred ten degrees. Ah, the glory days of being a poor, newlywed, college student. What I’m trying to say is that I know Kate’s donation required sacrifice, that it was an offering cut from her heart. My mom is a retired teacher so I’ve always known the secret that all good teachers know: the children in my life teach me FAR more than I will ever teach them. The lesson I’m learning from Kate is that sacrifice is only that if it costs me something. And Kate’s not the only one teaching me that. The 7th graders at my school are studying Africa and as part of their study, they’re doing Vigilante Acts of Kindness for their families, friends and neighbors. In return they’re collecting donations for the Vigilante Kindness for Uganda fund. One boy cleaned out his grandmother’s rain gutters. A girl is washing the neighborhood dogs. They’re teaching me about what service really looks like. When I told my first graders about what the seventh graders are doing, they were indignant that our class wasn’t doing something. How dare I think that because they’re little they shouldn’t be part of this. Shame on me. So I set up a change jar in our classroom to include my little ones. Their donations come in pennies and nickels from pockets full of rocks and toy rings and string and other bits of childhood. One of my little ones donated her Tooth Fairy money. And when she dropped her coins in the jar, her gap-toothed grin stretched from ear to ear. One of my little boys earns quarters by taking in his elderly neighbor’s trash cans. He earns a quarter per can. The trash cans are taller than he is. When he put three trash can quarters and other change from his piggy bank in our jar, it was all I could do to blink back the mist in my eyes and thank him. I wish I could say that all of the surprises have been good and sweet, but there was also the person who has every luxury in the world and wrote me a check that bounced. As I watched the bounced check fee lower my own bank account, I felt swindled as I hung onto a thin hope that it was an accident. On the other hand, there’s the nudist, Atheist, bigot who heard about what my fellow Vigilantes and I are up to and he plunked $30 down on the table. It delights me to no end that though we are polar opposites, we’ve found common ground-in Uganda of all places. I’ve mentioned before that sometimes God has to make things really clear for me to get it through my thick skull. Okay, He has to do that most of the time. Lately, He’s been dealing with excavating my sour, sinful judgments. Think He can’t use the very youngest to accomplish His will? Enter Kate and a mess of other kids taking their neighborhoods by storm one quarter at a time. Assume that He will of course use the wealthy? I’ve got a bank statement that shows exactly how much removing that assumption cost me. Think God won’t compel the hearts of people who fall on the other side of most everything I believe? I’ve got thirty bucks, thirty good reminders, that God will use whomever He pleases to work in this world and that I’d do well to drop my judgments at the door, shut up and sit at His feet to watch it all unfold. I don’t know the words to describe the exquisite pleasure I get in doing this beautiful Vigilante Kindness work with you. Frankly, most mornings I wake up in disbelief that I get to do stuff like this. Me? Stubborn, sinful, judgmental me? Really? That’s the beauty of it. When I look at the line of people God is stringing together to do this work, it’s unusual to say the least. 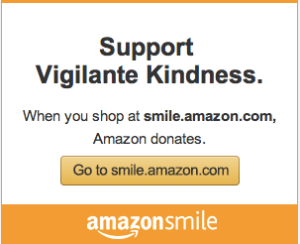 Wanna know who the Vigilantes of Kindness are? Here are just a few descriptors of our posse thus far. We’re 7 year olds and 87 year olds, too. We’re starving artists and the wealthy elite. We’re mothers and daughters, fathers and sons. We’re dog washers and cat lovers. We’re Atheists and the devout. We’re hunters and elephant lovers. We’re pure hearted and judgmental, sometimes in the very same breath. We’re countless different races and we make our homes in seven different states. God can and will use whomever He pleases. And at the end of the day I lay my head on my pillow, grateful and delighted to be counted as one in that messy, magnificent menagerie. Earlier in the week I spoke to one of the local Rotary clubs about the work I’ve been doing in Uganda. I talked about how small acts of kindness can make great differences. I told the story of my friends, Becca and Gerald, who dropped by just before I left for Uganda last July and gave me a handful of bills with the simple instructions to, “find a kid in need and help them”. I told the Rotarians how I’d used that money to buy a kid a mattress. Of course there’s more to the story than that, but you can read it here. He slipped away before I could even catch his name. I tucked the bills into my purse and later in my kitchen I smoothed them out and smiled at the seventeen dollars on my kitchen counter. Last spring a friend of mine popped by my classroom and handed me a wad of crumpled bills. She offered up some kind words about the things I’ve been up to in Uganda and then she said, “I’m sorry it’s not more.” I tucked her donation into my pocket and that night when I was changing into my pajamas, I took it out and counted each bill. I couldn’t help but smile at the three dollars in my hand. I learned a great lesson from my friend and her three dollars. In fact her three dollars caused me to trip over my pride and do a big ole faceplant into a puddle of my own mucky ego. If I were telling you this story in person over a cup of coffee, here’s the place where I’d lean in and whisper because I’m not proud of what I’m about to say. I can recall countless times when I’ve had the opportunity to donate to worthy causes and have been too embarrassed to find that my wallet has a lone five dollar bill. Or one tired dollar that has been through the washing machine too many times. Or frankly sometimes the only thing in my wallet was a quarter sandwiched in between two pennies. And I didn’t give anything because I was embarrassed by what I thought was an inadequate, meager amount. So I gave nothing. Not a cent. You tell me who was the kinder person? Me the embarrassed person who didn’t give anything or my friend who gave three dollars? She wins the kindness race by a landslide. I don’t mean to get all preachy on you, but these donations carved from the hearts of my friends remind me so much of the story of the widow’s mite in Mark 12. Writer Laura Turner, who is a kindred spirit (because she, too, hates birds) lays out the story beautifully. “Many rich people threw in large amounts.” But this story is not the story of many people. This is not the story of large amounts of money, or of someone doing something flashy and noticeable. This story is about one of the least noticeable things in the entire New Testament. There are no angels winging around the throne of God; no demons being cast out into a flock of pigs or man being lowered down from a roof to receive healing. There is this woman – this small, unnoticed, uncared-for woman who hardly counted as a person in her society. And there were two coins. ‘Mite’ is not the actual name for what the coin was. It was a term in use when the King James Bible was being translated in the early 17th century, and it was the equivalent of a few minutes’ work. ‘Lepton’ would have been the word used for the smallest copper coin in Israel at the time; this is the story of the widow’s leptons. And this story was probably going unnoticed for years. We don’t know how long the widow had been going to the treasury with her two coins, but we can assume that when her husband was alive, she would have had more. Not much more, necessarily, but she would have had resources to live on. Poor and without resources or power, she came to the temple and walked among the crowd who gave a lot of money mostly to increase their sense of stature in the community. And she came with the most meager of amounts to drop in the trumpet, and she did not draw attention to herself as she gave, but her story lives on as one of the most powerful examples of generosity and radical trust that we know. Because Jesus saw the treasury then, and he sees it still today. Jesus knew this simple truth: How we behave in the treasury is a direct reflection of the internal reality of our heart. This woman was a hero of our faith. This act of giving was not foolish and was not undertaken lightheartedly. She gave all that she had. I feel incredibly, gratefully, humbly blessed to get to see the internal realities of the hearts of my friends and family as they give their two leptons to help the people I’ve come to love in Uganda. Beloveds, I can’t tell you how deeply it moves me to watch you fold my Ugandan family into your hearts, to wrap your arms around them all the way across a vast ocean. I meant it when I told the Rotarians that I believe small acts of kindness can make a great difference. My friend’s three dollars was enough to buy a mosquito net. In the kitchen after the Rotary meeting as I stared at the seventeen dollars on my counter, I wished I could tell the anonymous man that his seventeen dollars is enough money to take a sick kid to the hospital, to be seen by a doctor and to pay for antibiotics. Dear ones, if you’re able to donate and be a part of the story unfolding before me in Uganda, I accept your generosity with love and gratitude. But please, I’m begging you, please when you give, don’t apologize. Don’t even for a second entertain the thought that your donation is too meager or somehow not enough. Hear me when I say this to you. And here’s the lovely thing about small kindnesses, when I put my two leptons with your two leptons, what may have felt small in our pockets adds up to something far, far greater than four coins. Um, is this thing on? I forgot how to use it. It’s lovely to be with you again. I feel like I should explain why I haven’t been here in quite some time, but the truth is I don’t have a reason. I just didn’t have anything worth saying. Two things have compelled me to write today. First of all, tomorrow I get to speak at a Rotary meeting about my loved ones in Uganda, my Vigilantes of Kindness here at home, and the beautiful stories we wove together last summer. I’m thrilled to share and horrified, absolutely horrified, at the thought of speaking to a largish group of adults. Just thinking about it makes my armpits drip sweat. Hang on a sec while I go administer copious amounts of deodorant. Talk amongst yourselves. Alrighty, now that I’ve got that under control, the second thing that made me pound away at the keys today is Neil Gaiman. You know him, right? Amazing author, incredible speaker. He probably doesn’t sweat a drop when he speaks. Anyway, Neil Gaiman has written several brilliant New Year’s benedictions for the world. You should read them. You’ll be better for it. Promise. For the conclusion of my Rotary talk, I reflected on my trip to Uganda and the year as a whole and then I wrote my own New Year’s benediction. It’s as much for me as it is for you, but most especially it’s for my Vigilantes of Kindness from last year and the Vigilantes who are already on board with me as my return trip begins to take shape. I’m grateful for each and every one of you. You inspire me. You move me. You make me absolutely giddy to see what’s in store for us this year. In this new year, I hope you love deeply and are loved in return. I hope you find family in the most surprising times and places. I hope you make beautiful plans, but more importantly I hope that when your plans fall broken at your feet, because they sometimes will, that in quiet solitude you’ll want nothing more and nothing less than to hear God. And then I hope you’ll listen for His voice, listen so hard that the pounding of your heart overwhelms your eardrums and your very spirit. I hope you’re tickled and delighted when He answers you in the most unexpected of ways and suddenly you find yourself living a dream greater than you ever fathomed. I hope that when you encounter inequality that you will resist the urge to run and instead stand with feet firmly planted in justice. I hope that your voice, quiver as it may, rises from your throat in defense of those who have not been allowed to speak for themselves. I hope that both in the warmth of joy and in the cold face of contempt, you’ll know beyond a shadow of a doubt that beauty rises from our tender, broken places. Most of all I hope that in this new year you’ll be passionately, unswervingly, desperately vigilant in lavishing kindness on one another.